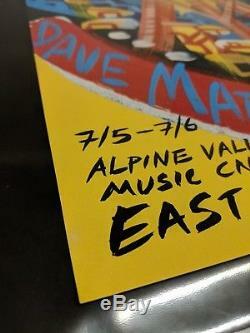 Dave Matthews Band Alpine Valley 2003 poster (7/5-7/6) Limited Edition Artist: Steve Keene Size: Measures 16.5 x 22in Edition: 1st edition show poster This poster is a beautiful rarity, the first ever DMB show poster for Alpine Valley, as 2003 was the first full year of individual show posters at DMB shows. 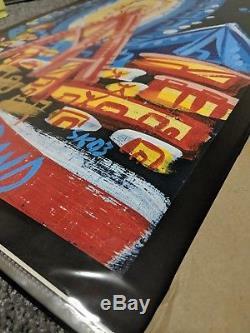 Steve Keene DMB show posters from 2003 are not signed or numbered, and quantities were extremely limited -- estimated to be 100-200 depending on the show. There has been just 2 recorded sales of this poster in the past SIX YEARS, so it certainly is a rarity when it comes to DMB posters. BuyItNow or submit your best offer today, as there's no telling when another one will be available for sale. 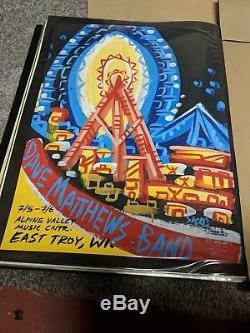 The item "RARE FIRST EVER DMB ALPINE POSTER Dave Matthews Band Alpine Valley Keene 2003" is in sale since Saturday, April 21, 2018. This item is in the category "Entertainment Memorabilia\Music Memorabilia\Rock & Pop\Artists D\Dave Matthews Band". The seller is "domo0217" and is located in Rockton, Illinois. This item can be shipped to United States, Canada, United Kingdom, Denmark, Romania, Slovakia, Bulgaria, Czech republic, Finland, Hungary, Latvia, Lithuania, Malta, Estonia, Australia, Greece, Portugal, Cyprus, Slovenia, Japan, China, Sweden, South Korea, Indonesia, Taiwan, South africa, Thailand, Belgium, France, Hong Kong, Ireland, Netherlands, Poland, Spain, Italy, Germany, Austria, Israel, Mexico, New Zealand, Philippines, Singapore, Switzerland, Norway, Saudi arabia, United arab emirates, Qatar, Kuwait, Bahrain, Croatia, Malaysia, Brazil, Chile, Colombia, Costa rica, Panama, Trinidad and tobago, Guatemala, Honduras, Jamaica.